From the moment you begin to descend along the winding paved driveway to your Ellijay vacation cabin rental, you'll know you're in for a very special vacation. 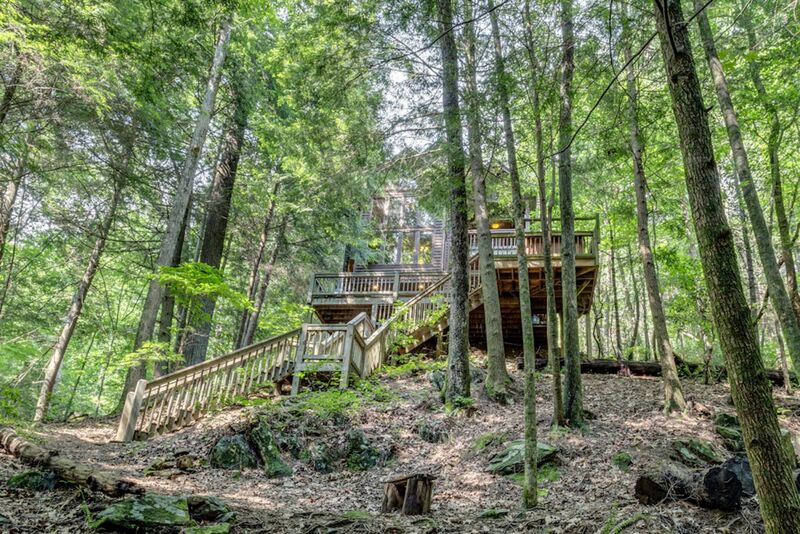 The dense green trees and foliage help you begin to relax with fresh air and peace and quiet. 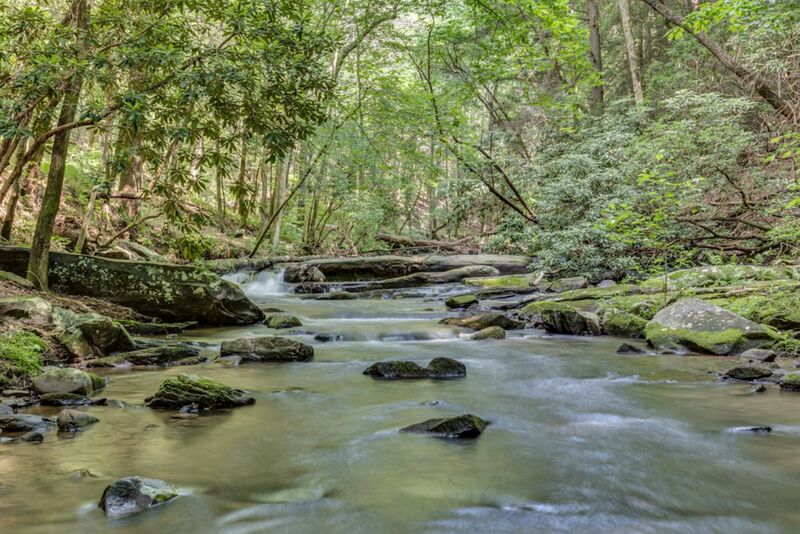 Then you hear the sound of rushing water and cascading rapids of Turniptown Creek and the beautiful twin falls, and you know you found the best cabin only 3 miles from Ellijay. 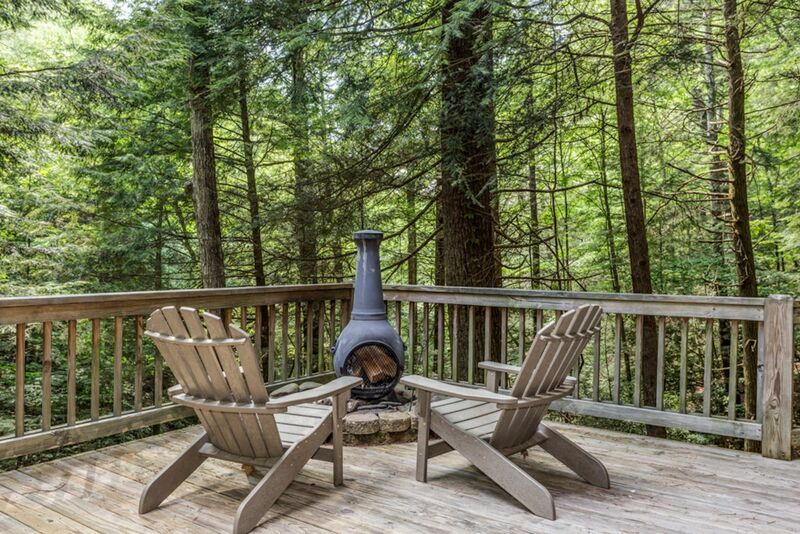 Shady and serene, your cabin is nestled into a steep hillside overlooking the creek, and you'll love relaxing in your Adirondack chairs with the chiminea burning red embers that take you into the evening. Later on, take a short walk along the creek, and enjoy the high vantage points for fantastic water falls. 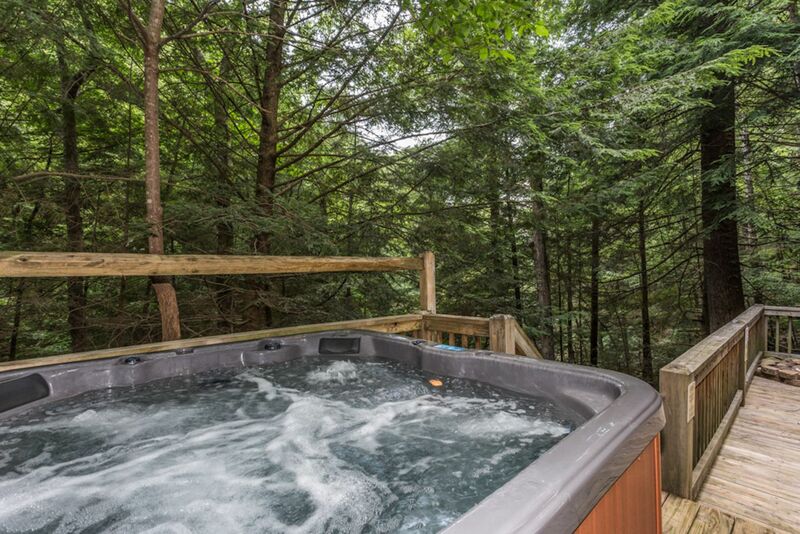 The hot tub is perched on a small landing, just above the main deck and you'll appreciate your covered patio and fully equipped kitchen and dining area where a cafe style table and stools wait to serve family and friends. And morning coffee never tasted this good. 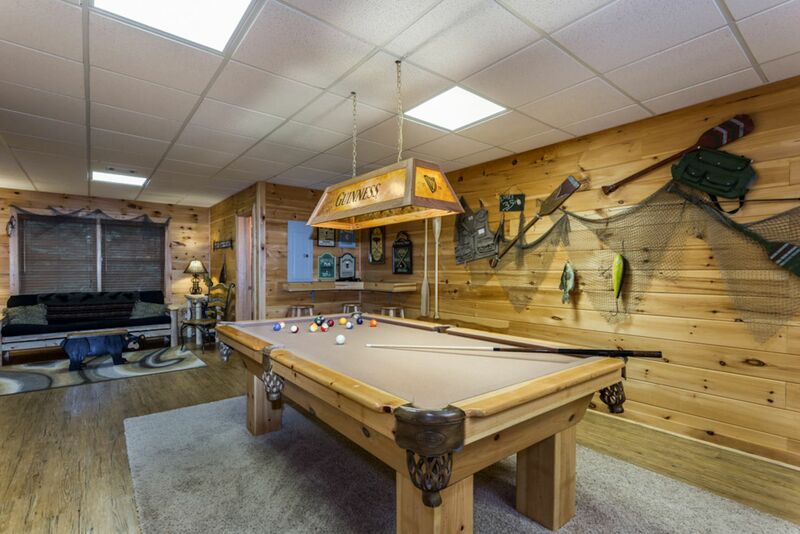 Inside the cabin, the lower level has an open floor plan, and the game room has a full size pool table, televisions, and seating areas and plenty of space. French doors lead guests into the terrace level bedroom with king size bed, where picture windows line the water-side of the room making it the closest you can get to sleeping outside without the bugs and occasional furry visitor sniffing around. 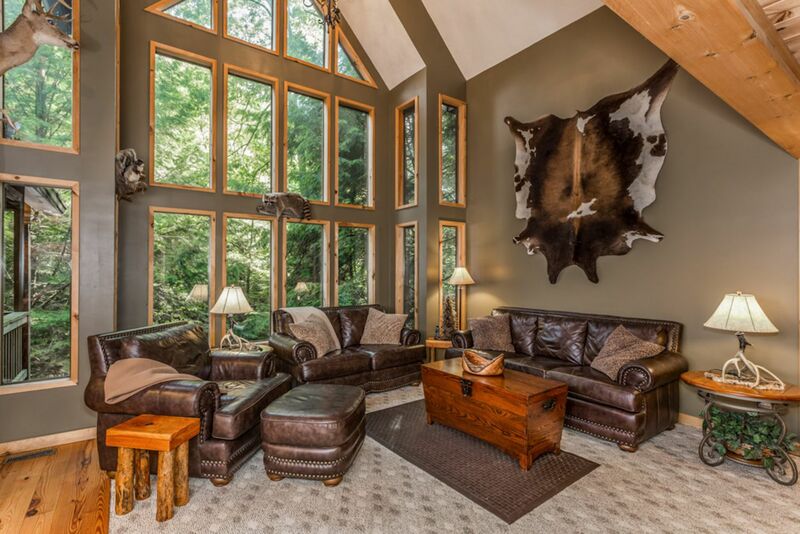 The picture windows in this cabin give full view of the surrounding lush natural setting. 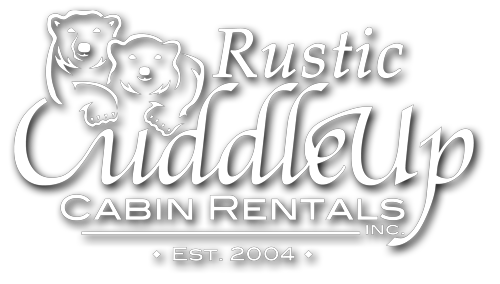 The rental cabin is equipped with a flat screen in the great room and rustic dining room creates a cozy lodge atmosphere that is hard to beat. And be sure you head to the mountains with plenty of groceries because Twin Falls spacious kitchen is fully-stocked with everything you could possible need to cook a great family meal. The second level of your cabin is dedicated to relaxation, a spacious sanctuary. The upper floor plan of Twin Falls master suite creates an oversized room where the television is in view of both the king-sized bed and luxurious Jacuzzi tub. Another bedroom with a king size bed and private balcony overlooking the lush landscape surrounding the cabin is accessible from the cabin loft, as well as the cabins third bath. The open loft also holds the cabins twin beds. Once inside Twin Falls we are certain you will find everything you need, but should you decide to wander from the falls you will discover the gated community offers its homeowners and their guests plenty of other exciting ways to pass the time. Your family or small group has access to four fishing ponds, a community pool, playgrounds, picnic areas, as well as community events and festivals. Twin Falls location also puts guests in the heart of Ellijay apple country and perfectly situated to enjoy the annual Apple Festival as well as tubing on the Cartecay or Coosawatee Rivers, boating on Carters Lake, shopping or dining on the historic square or even golfing at area clubs. And if you crave a bit wilder water, you can always make the short half hour commute to the white water rapids of the Toccoa River. See all of Twin Falls Amenities and Features! The location of the house was very peaceful, yet convenient to major attractions, 5-10 minute drive. The basement gameroom was perfect for entertainment.